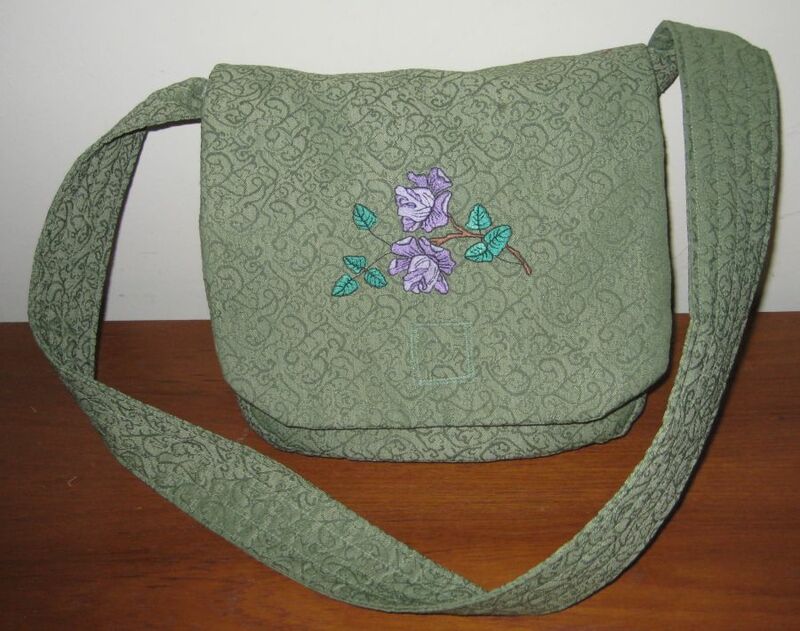 On this site I'll share pictures of some items I've made plus some information on minor problems I've encountered with my ULT2001 embroidery machine and my solutions, shown on my ULT Fixit Page. My site statistics show interest from Germany so I have added a link to Google's German translation program - I hope our German visitors find this useful (or humorous if something is lost in the translation :-). 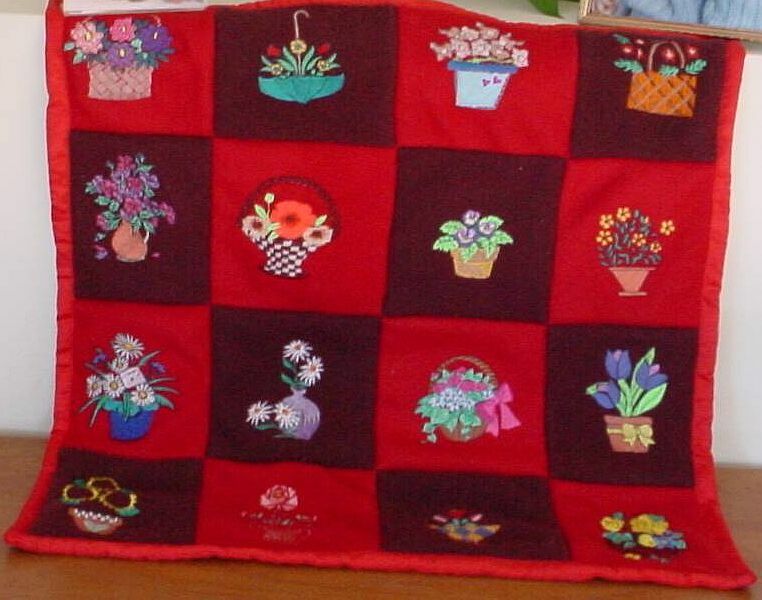 My Flower Quilt. 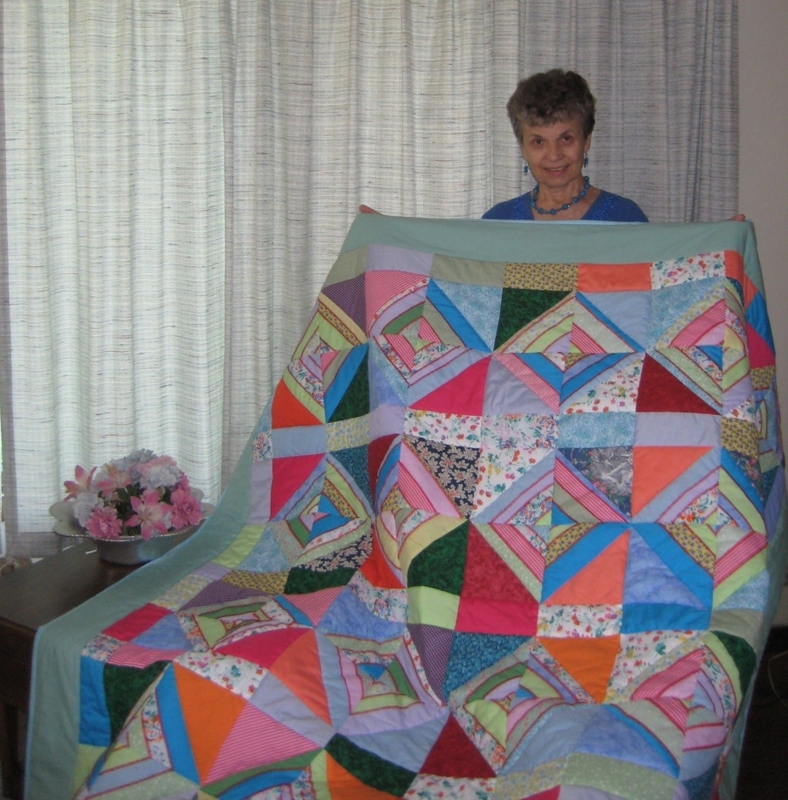 I was impressed with a quilt by Jean-Claude on the SunBonnet site (which has disappeared). I substituted the sunbonnets in each white diamond with a flower. 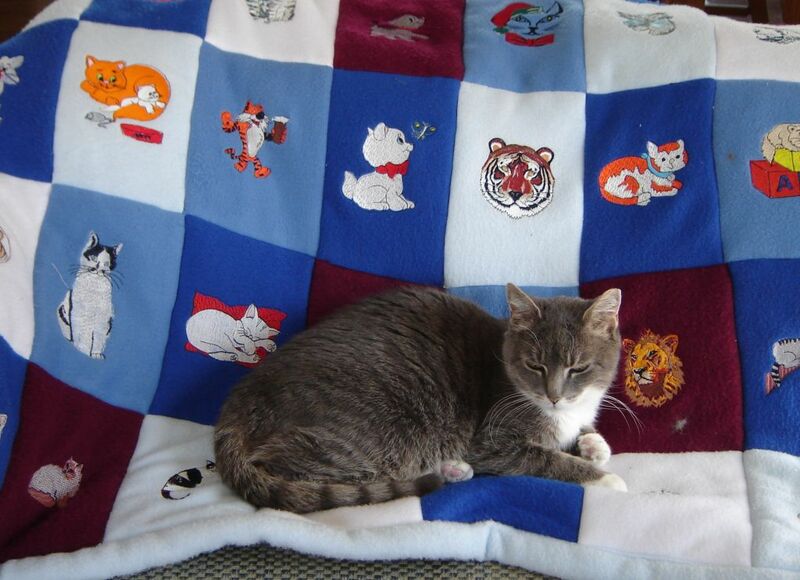 The quilt turned out well but of course, it is not perfect. It gave me a chance to dig into my vast supply of left over fabric and use 63 flower designs from my large collection. 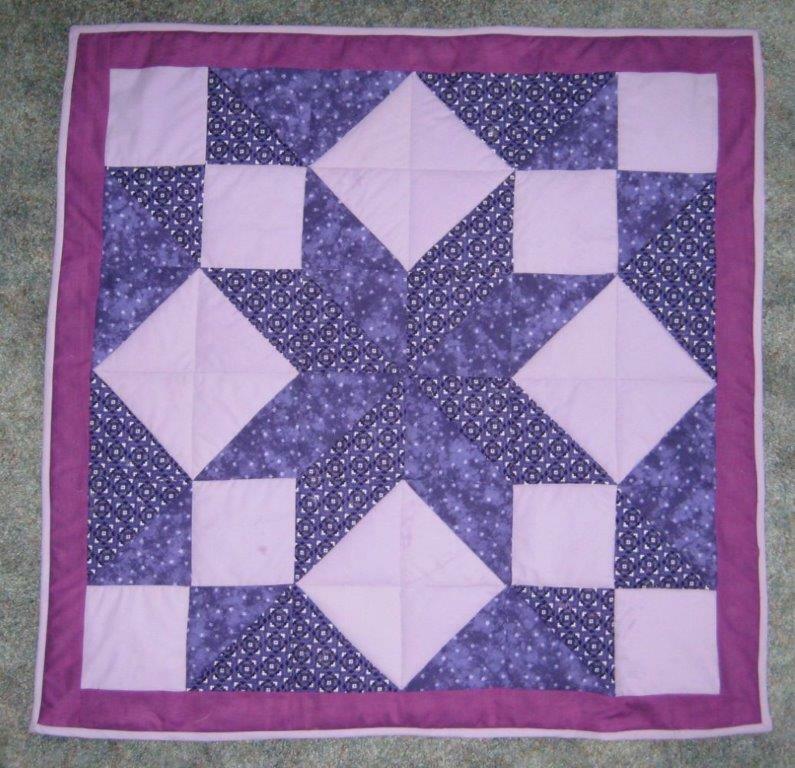 I learned a lot from this, my very first serious quilt. It was an enjoyable project. 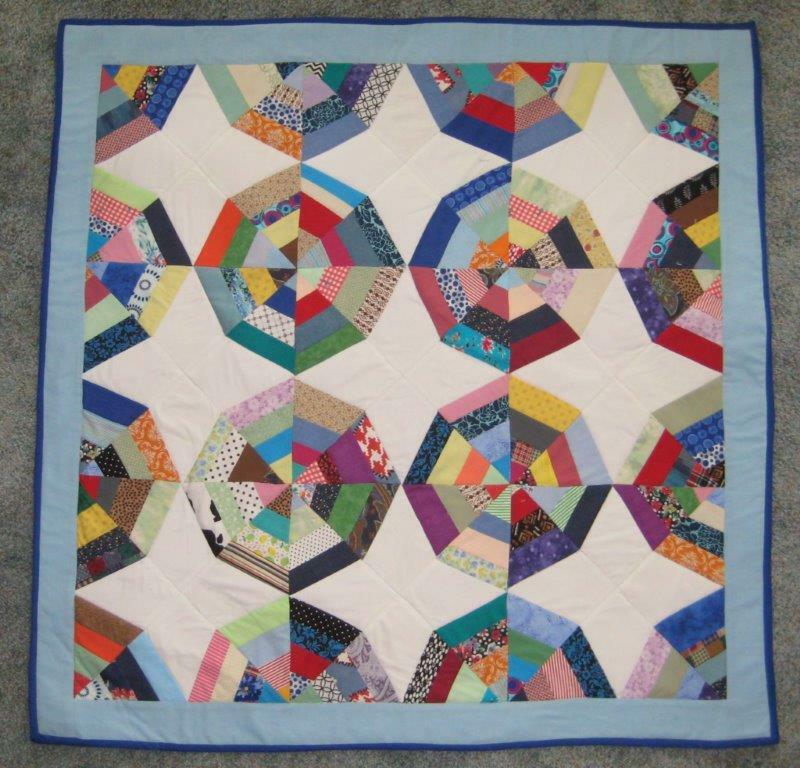 Here's a quilt based on geometric designs. 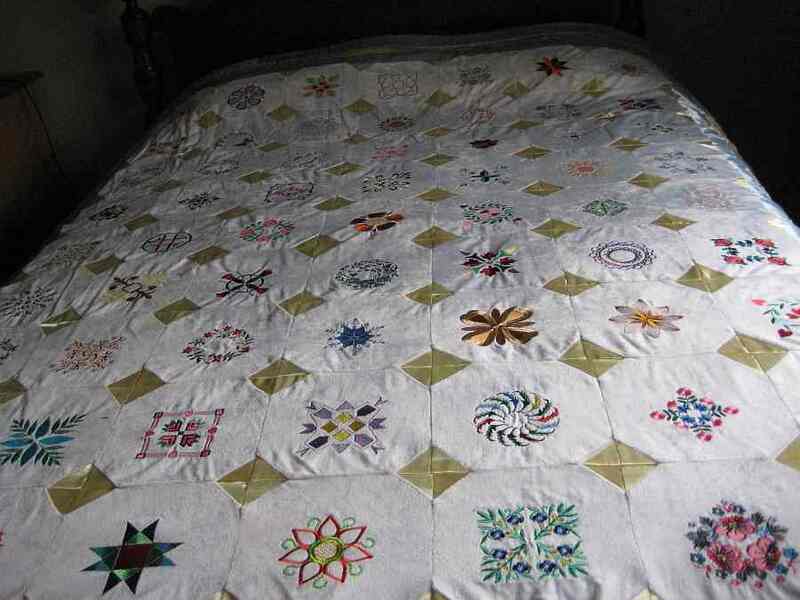 This paper piecing quilt is called flying geese or toad in the puddle. 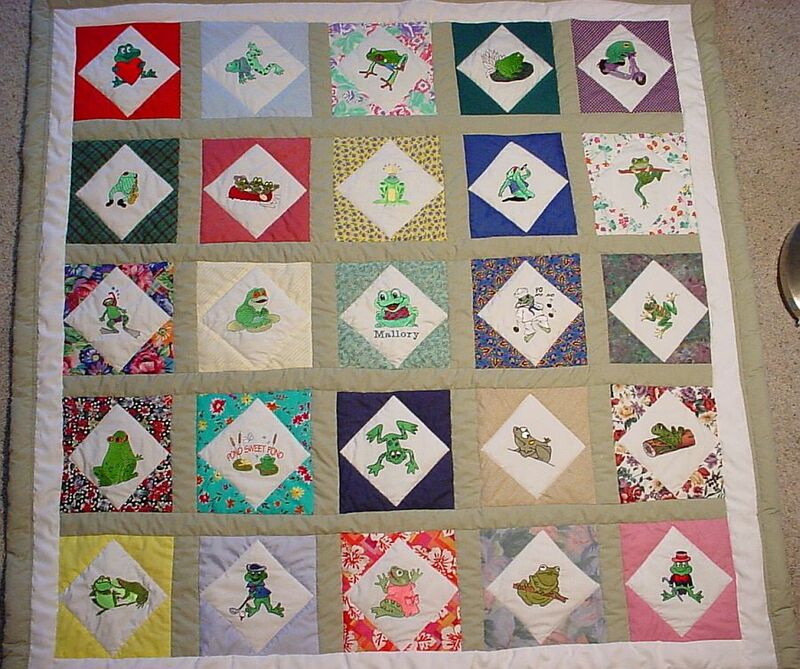 My granddaughter Mallory's nickname is "Frog" so I made her a small Frog Quilt (50"x50") from pieces left over from the flower quilt. 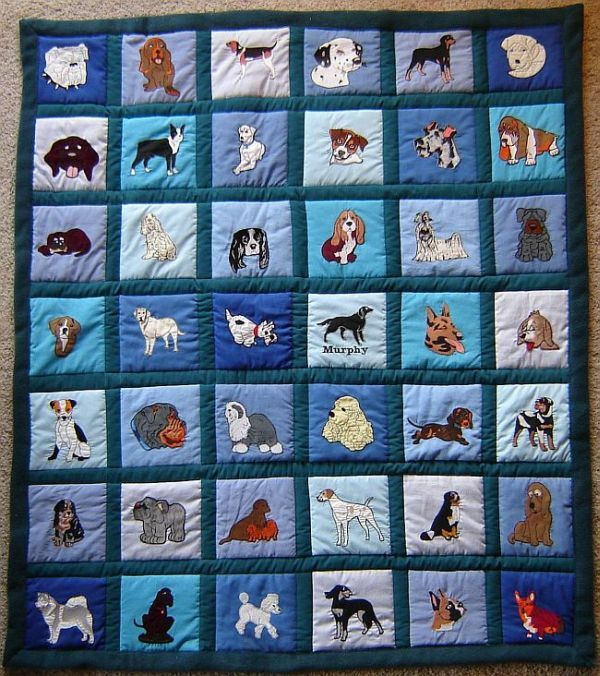 My granddog, Murphy, needed a quilt because she was ruining my daughter's couch; each dog design is partially appliqued. 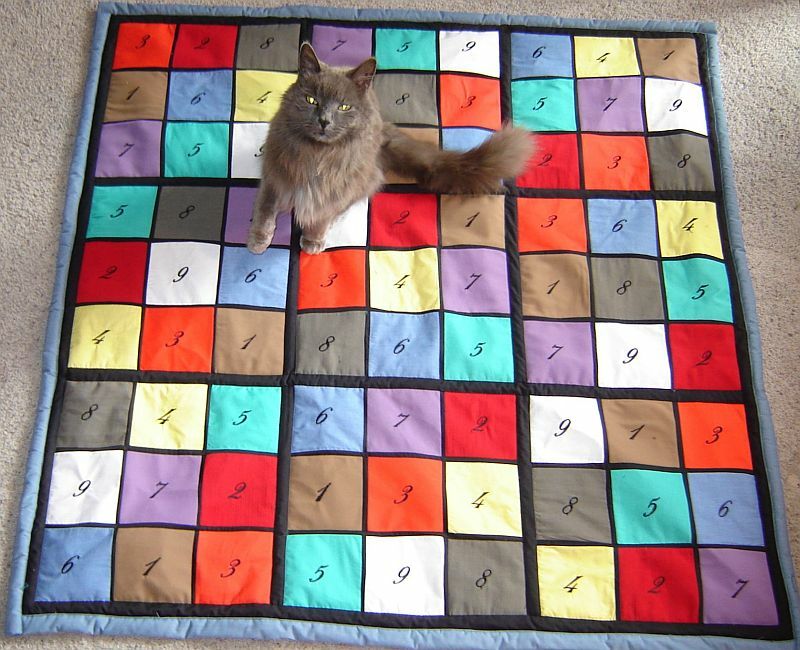 Then our cat wanted a quilt too, of course. 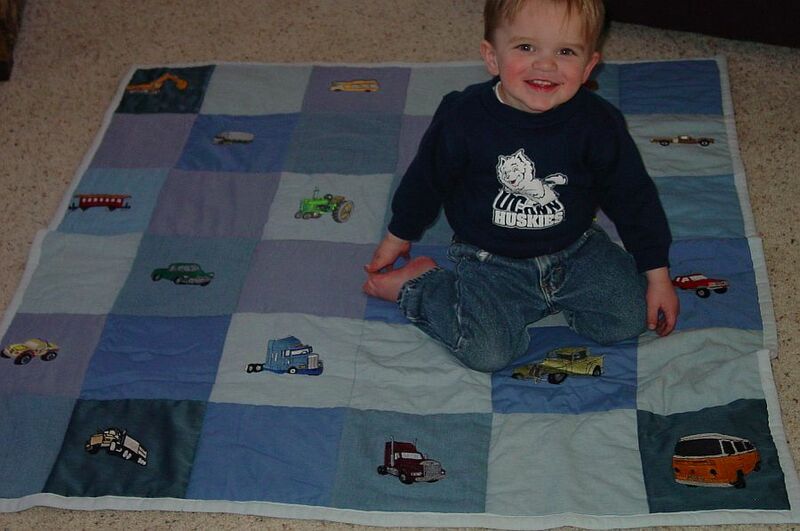 My grandson, Jordan, is a vehicle buff so I made a quilt with trucks, tractors and vans embroidered on the squares. 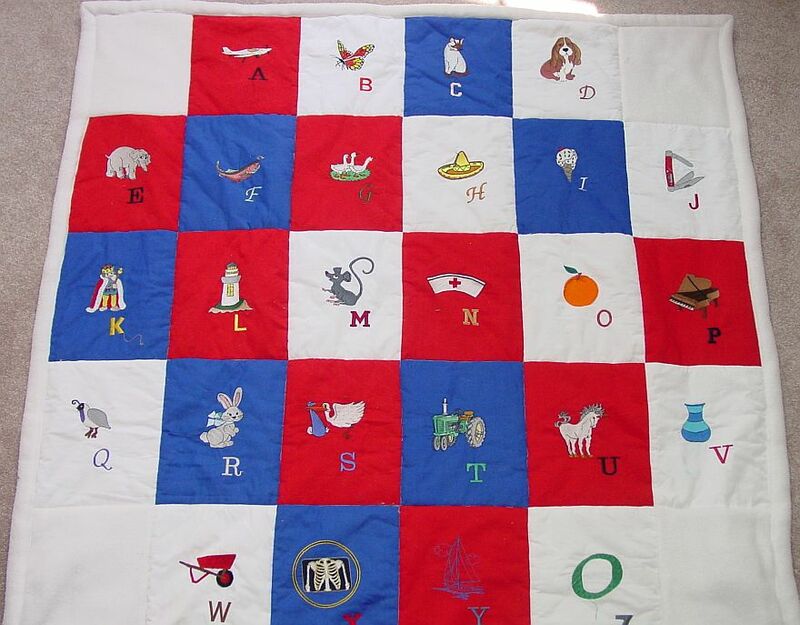 This alphabet quilt is to encourage Jordan to read (he can identify many letters already); the squares are leftover pieces of fleece. Jordan has outgrown his crib so I made a Card Trick Quilt for his "big boy" bed. 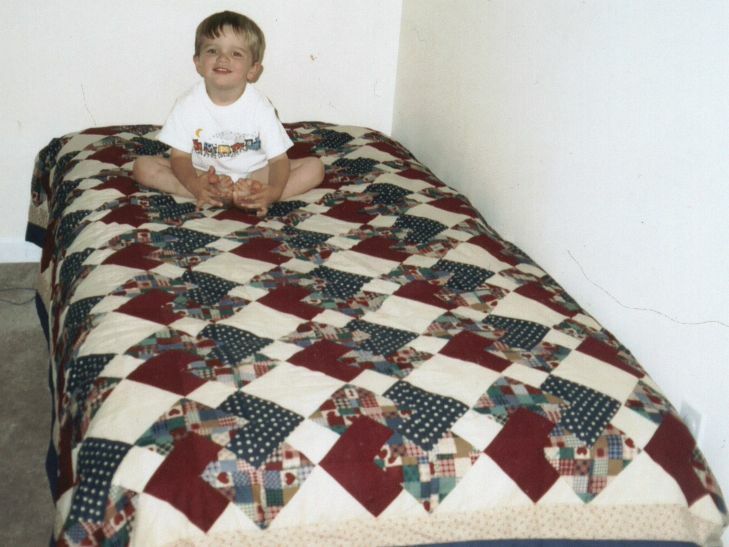 Now that Jordan has grown older it was time for a new quilt. 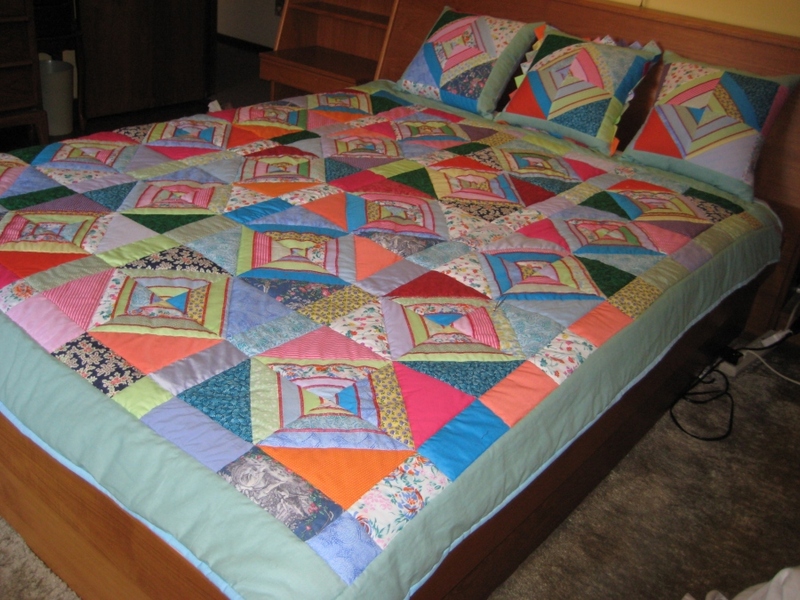 Log cabin quilts can be made to various patterns. 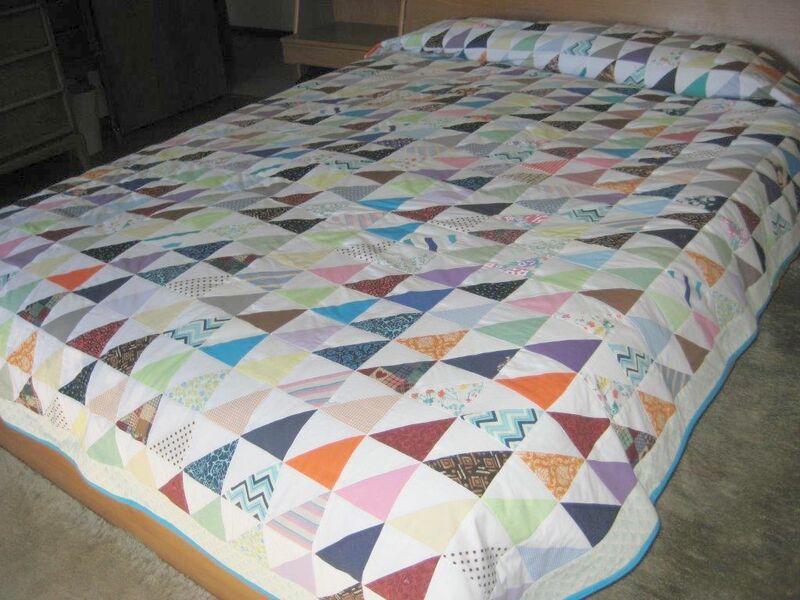 We drew the paper piecing pattern for this log cabin quilt; if interested, you can download and print my pattern. It prints as 7-7/8" square so you may need to fiddle with margins in your printer setup. 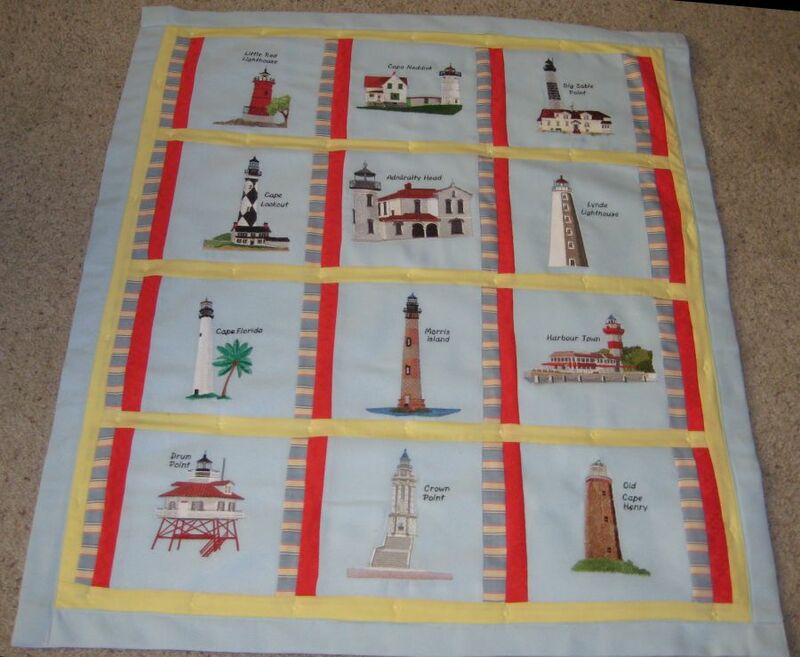 Using my new Brother serger and my ULT as a sewing machine, I followed Nancy Zieman's "Speedy Serge and Merge Quilt" instructions on YouTube to make this quilt. 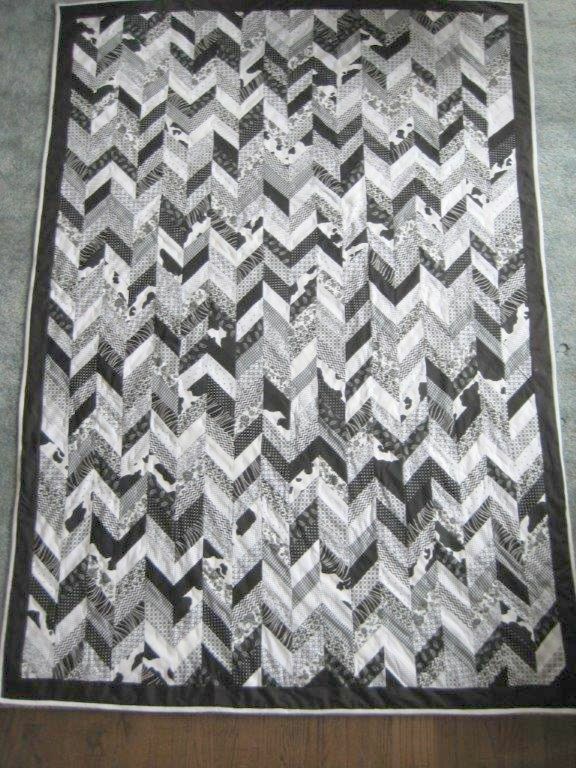 My granddaughter wanted a black and white quilt so I made this herringbone quilt. It was harder than expected to get the pieces to match - the YouTube tutorials made it look easy. 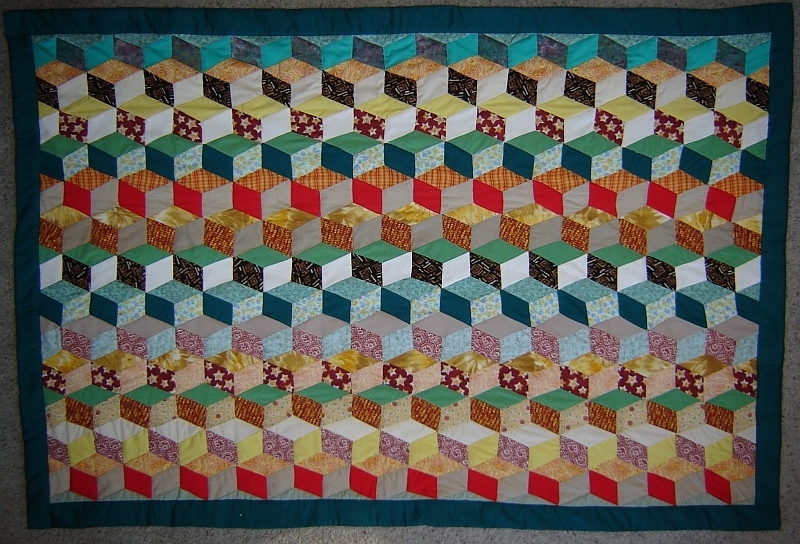 However, I eventually had to use paper piecing to get all the stripes to meet correctly. 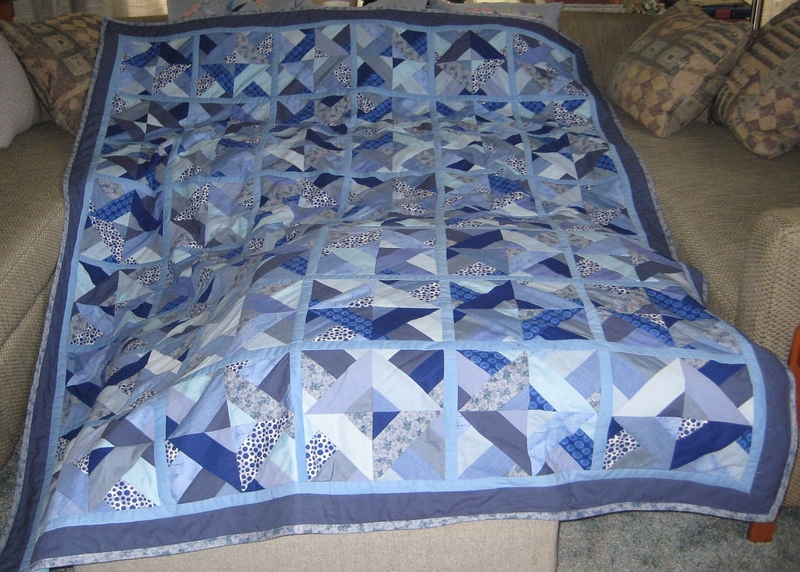 Unlike most quilts, this one I made in long strips and then sewed the strips together(details on request). A big star lap quilt for daughter Megan based on a YouTube tutorial from the Missouri Quilt Company. A 3-D tumbling block lap quilt sewed using Marci Baker's strip method; it was easier than individual pieces... but still a lot of work.Another project by Jenny Doan -- an abstract spider web quilt. 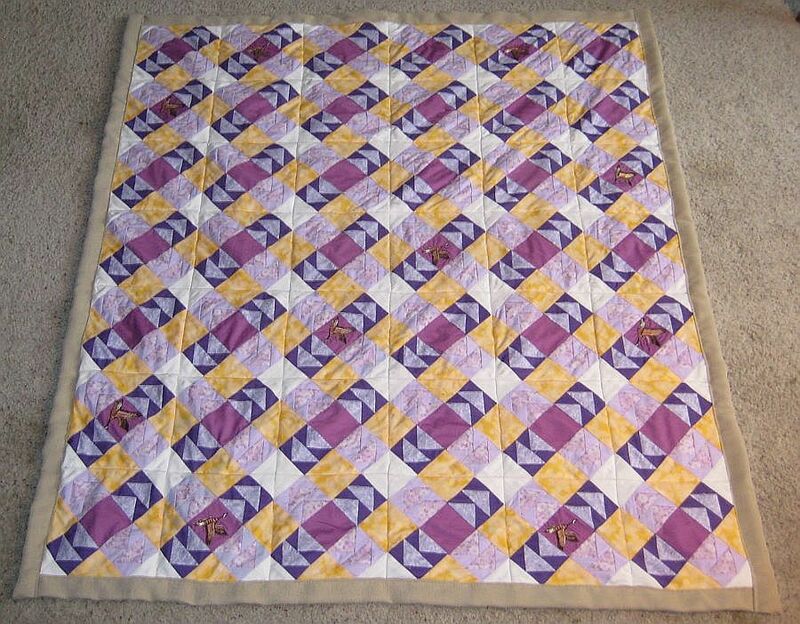 This queen sized quilt is called a half square triangle design. 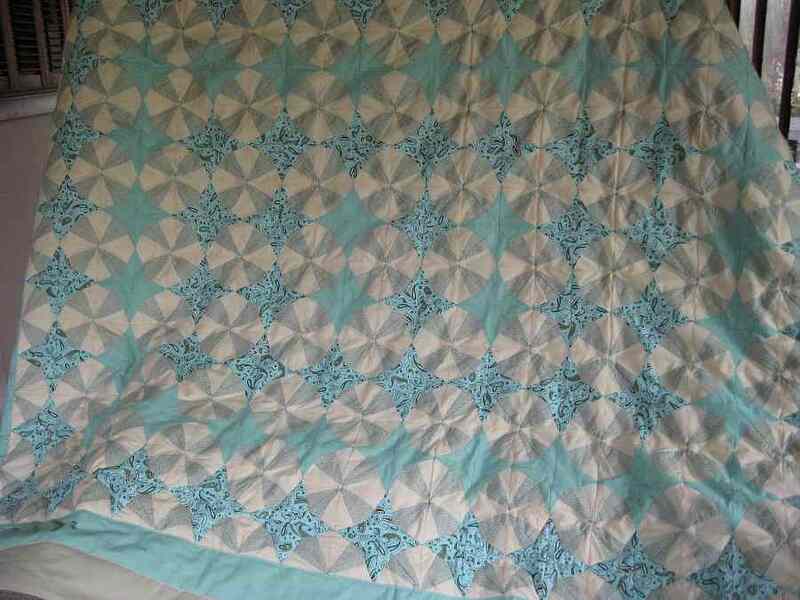 It is 26 by 20 4" squares = 1040 triangles so it took several weeks to sew all these little pieces together. 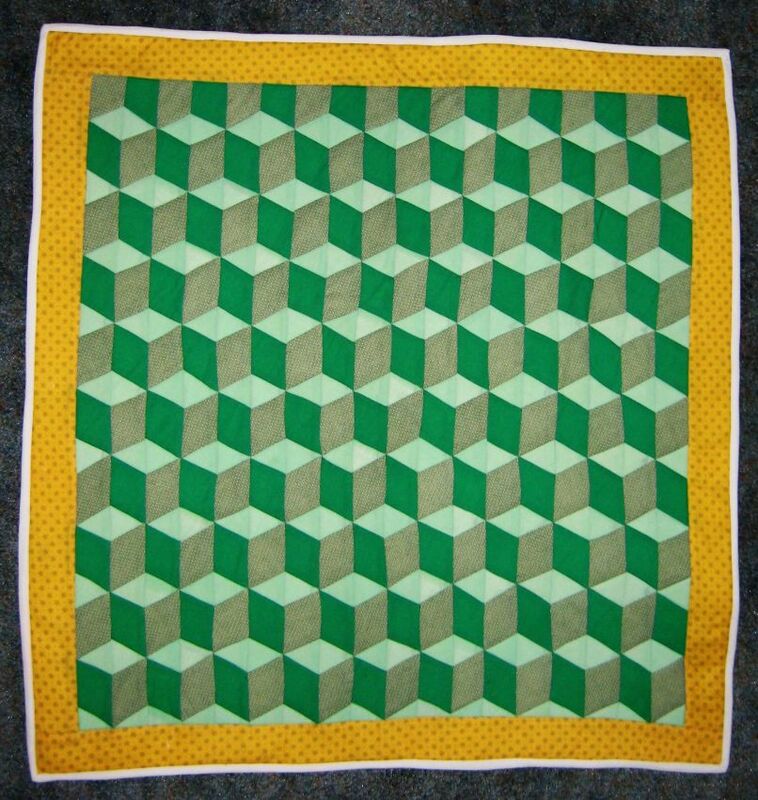 I found the design idea in the quilt gallery #67 at the squaresandtriangles site. 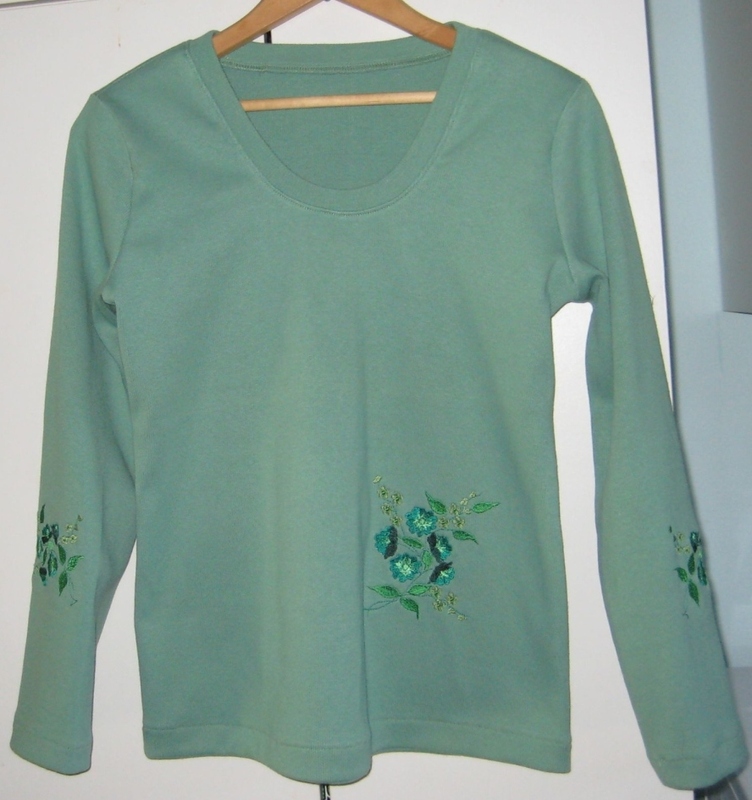 I have made clothing for myself and my family for many years; I now add embroidery as decor on some items. These sweatshirts have pockets for my husbands's glasses, something manufacturers generally forget. The shirts are some of my summer wear. The duckies were made with my previous machine, a Deco 600, and were complex to hoop because the hoop had to be clicked into 3 positions; the ULT does things like this more simply. 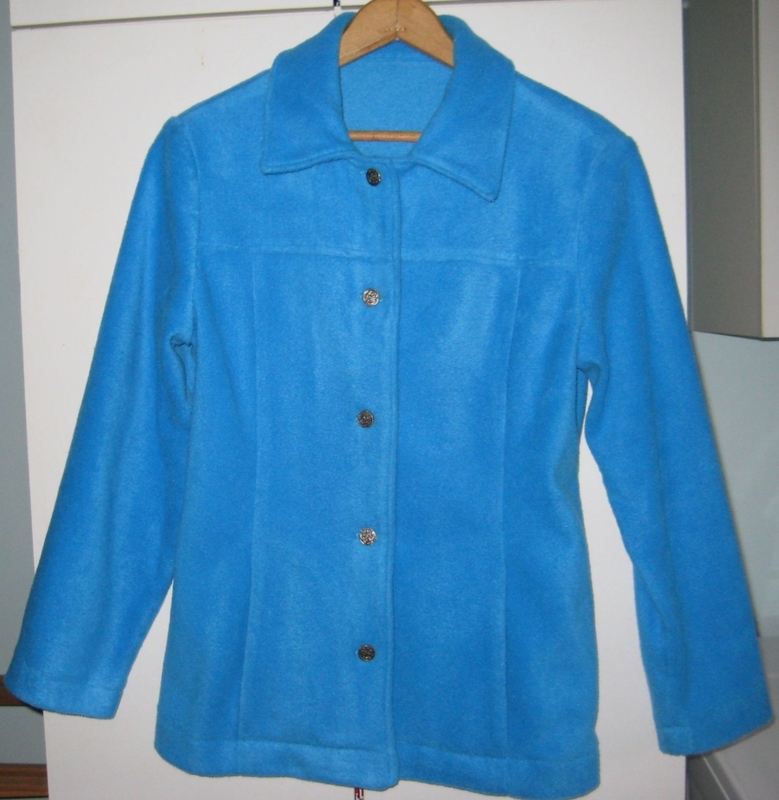 I used Simplicity pattern 5253 to make several fleece jackets. Variations on the pattern allowed short and long versions. 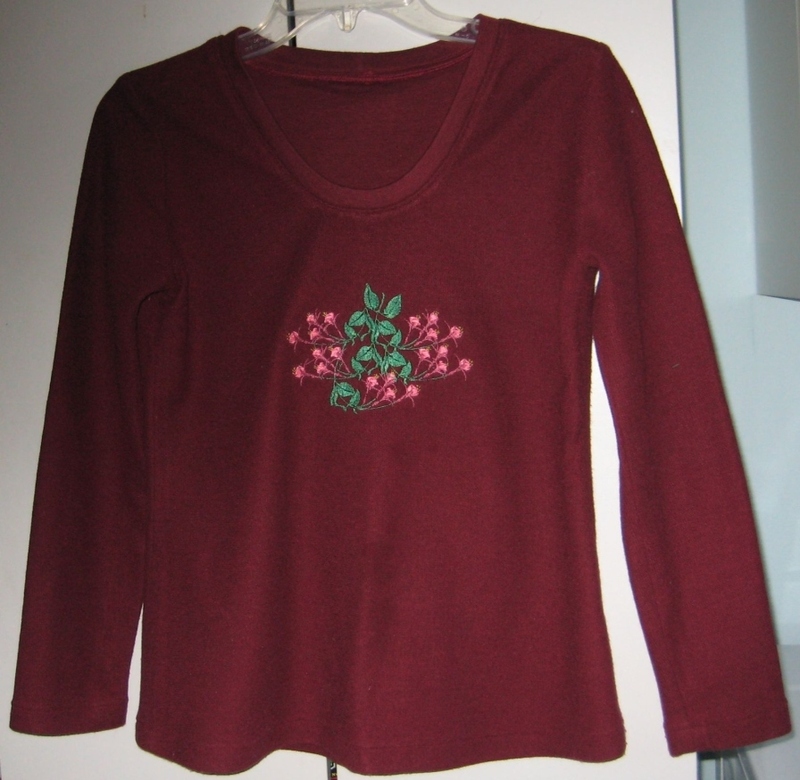 I also made jersey T-shirts by altering NewLook pattern 6753 in maroon and green, both embroidered. 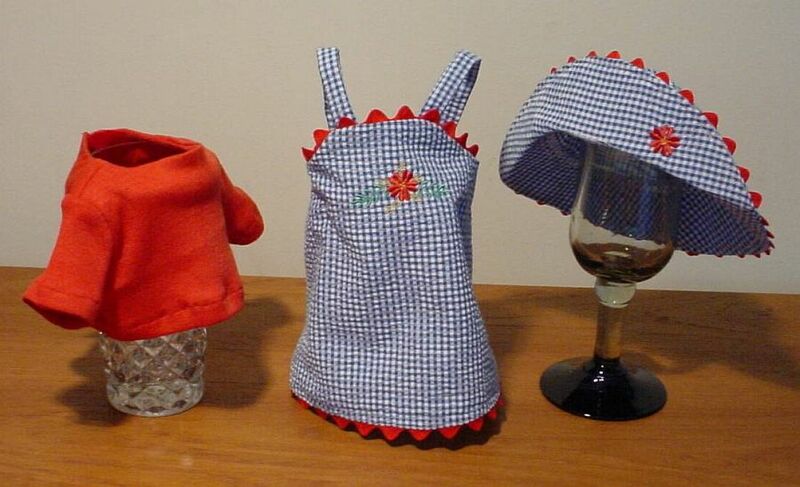 I make and embroider doll clothes for my granddaughter's American Girls. People often wear glasses but how often have you seen glasses do the wearing? 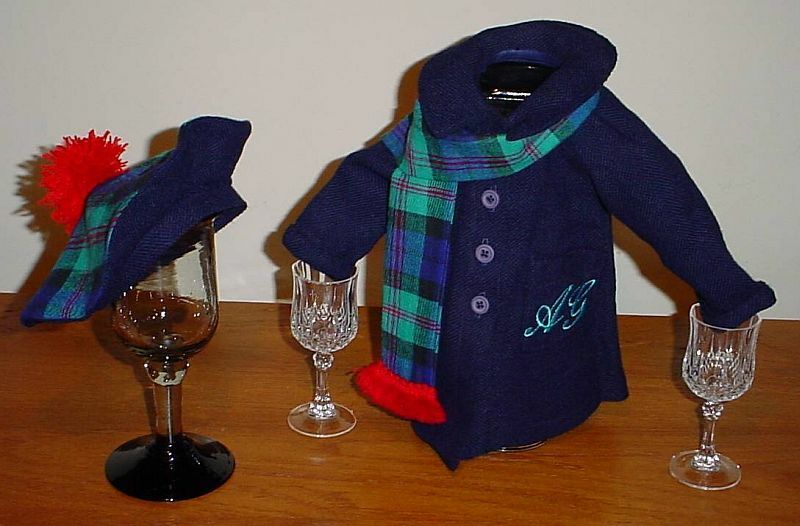 A coat and hat for that doll and here are those well dressed little dolls. 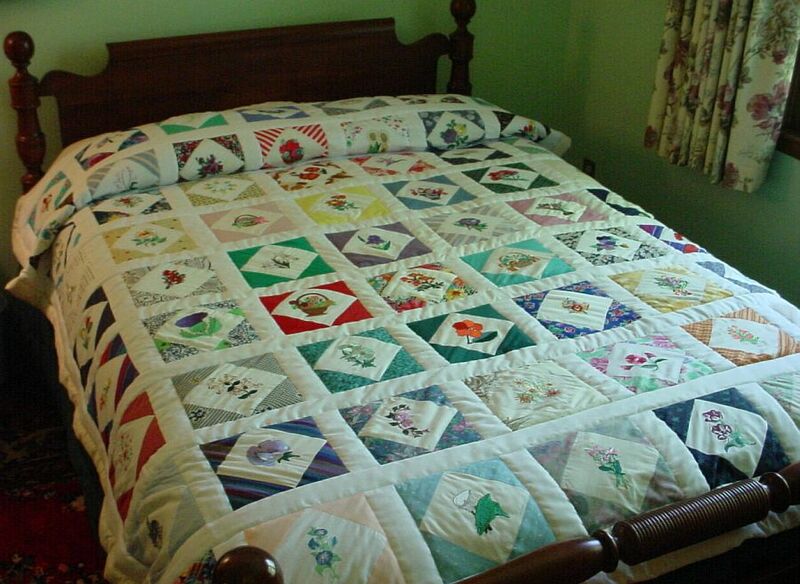 Of course, they need a quilt to go with that nightwear. 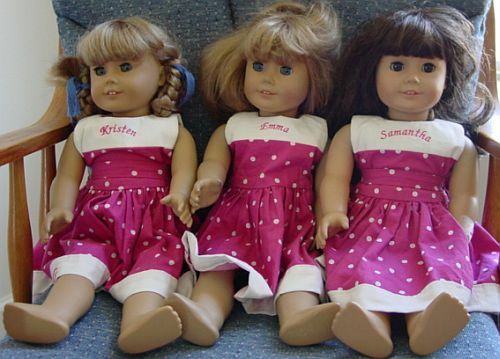 Here, all the dolls are dressed alike. 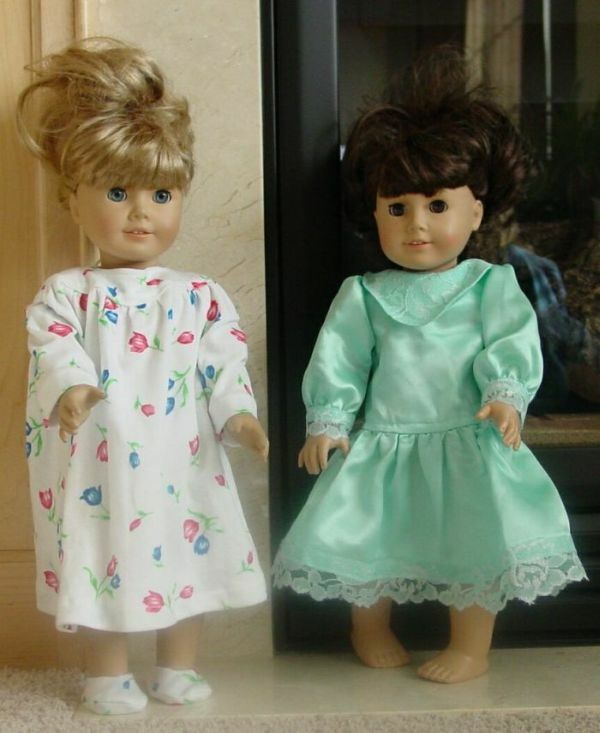 More dolls, so more dresses. 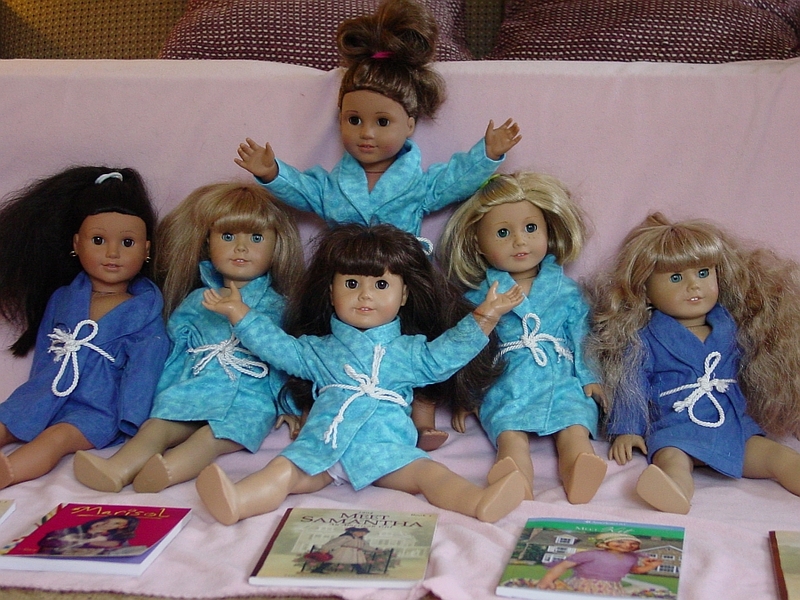 Of course, dolls need robes too. 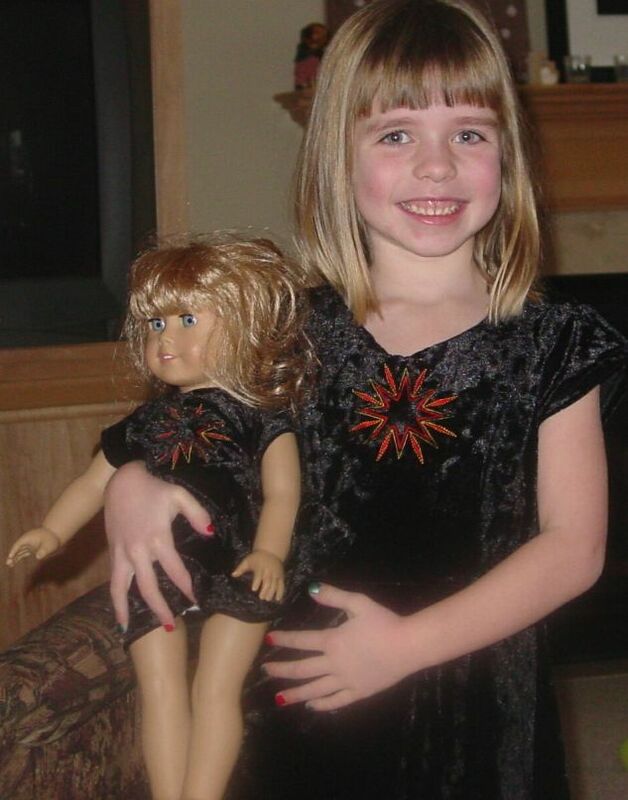 This is my granddaughter, Mallory, with her doll in matching outfits I made, copied closely from the American Girl catalog. 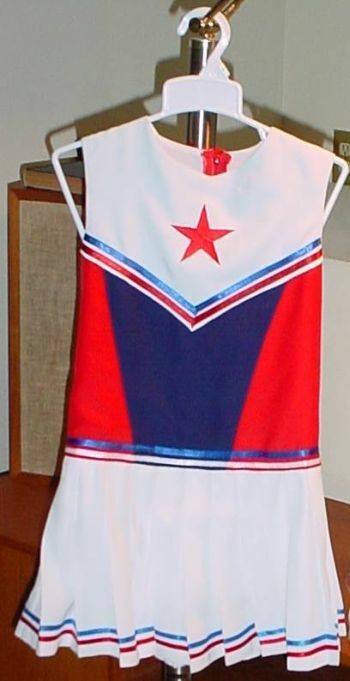 Here is a copy of the American Girl cheerleader outfit I made, sized to fit my granddaughter. In addition to clothes and quilts I occasionally venture into accessories, like this quilted purse. I quilted the fabric because I couldn't find a nice fabric pattern - a lot of unnecessary work. However the bag turned out well. 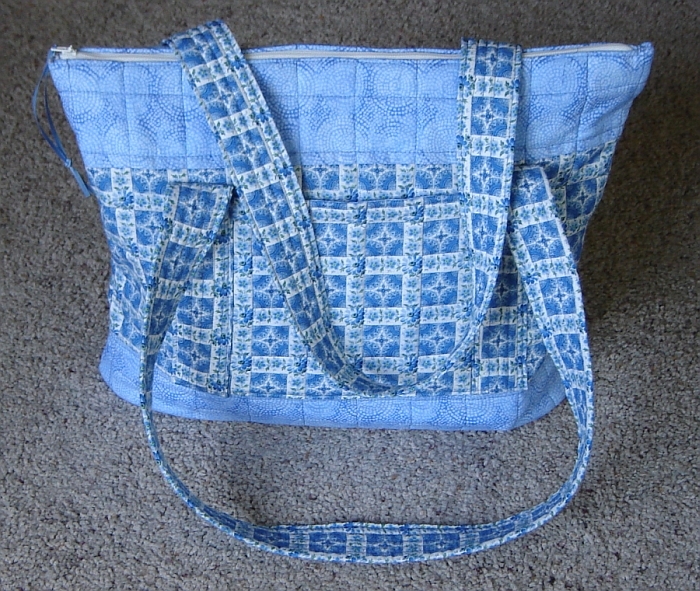 A smaller quilted purse, where I quilted the material using a decorative stitch from the ULT. 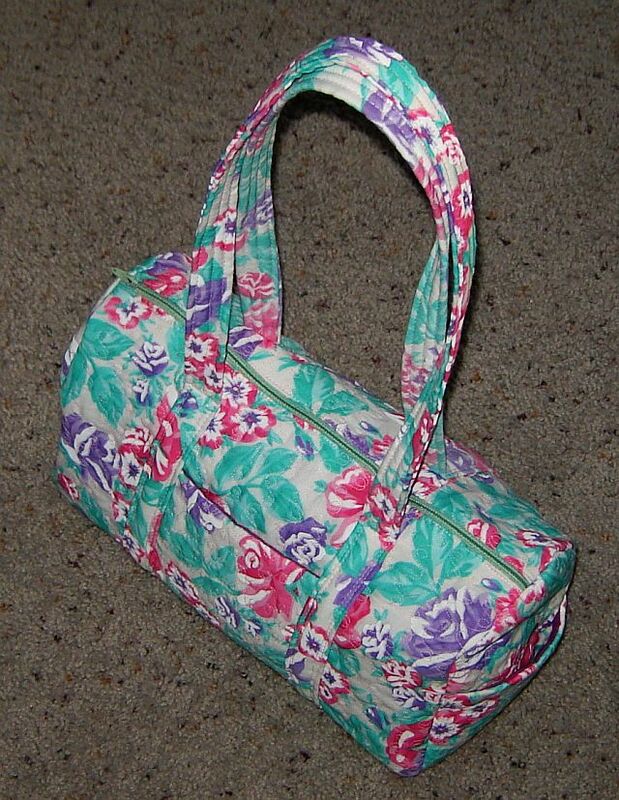 My third quilted purse is a copy of my daughter's expensive store-bought purse. 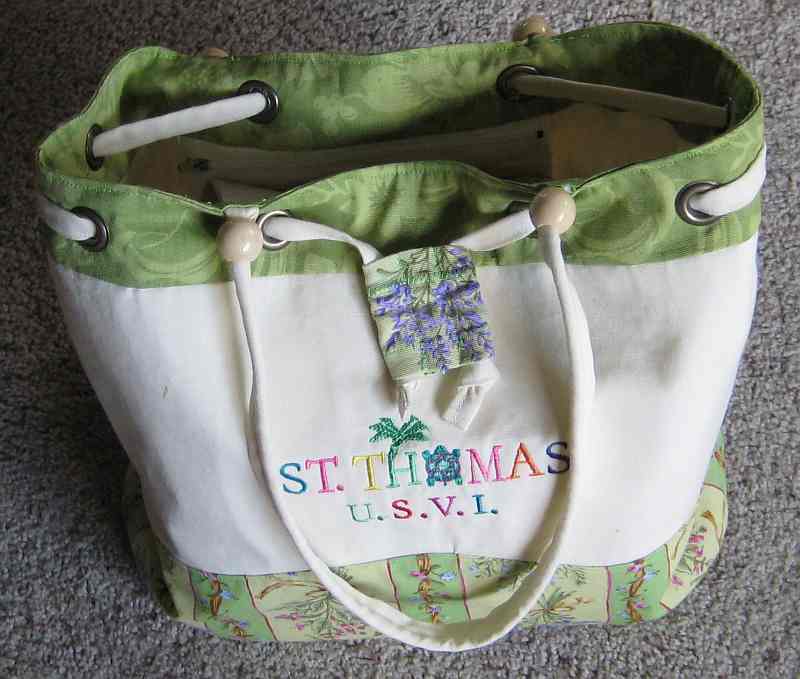 After a recent cruise, I made a copy of a bag I saw in St. Thomas; lots of work - it cost more to make than it would have to purchase but I met the challenge. 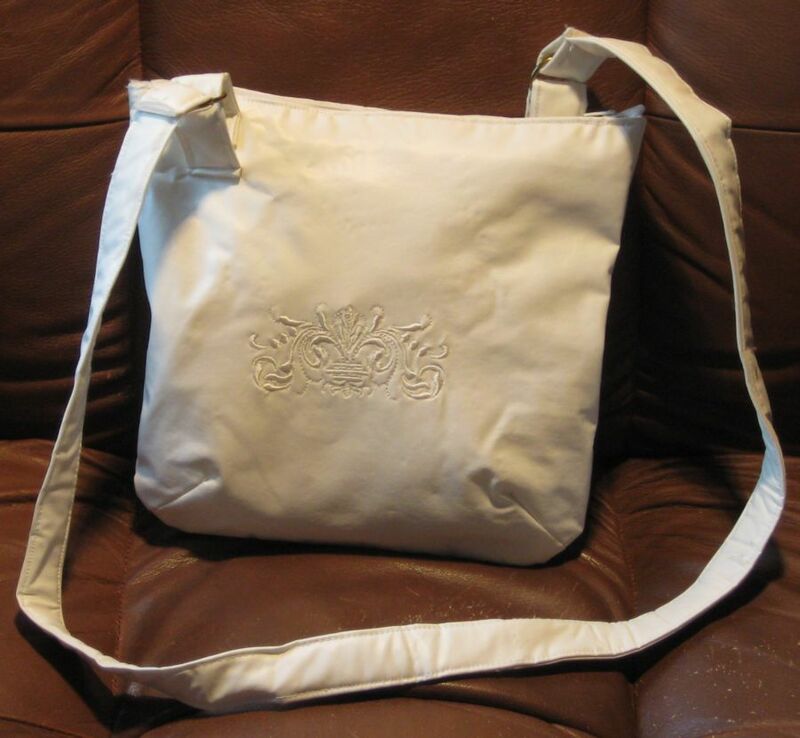 This vinyl purse I made from a pattern is white on white; vinyl embroiders nicely, no stabilizer required. 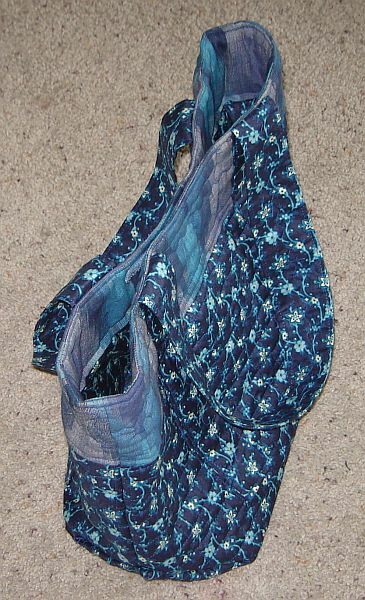 Leftover drapery fabric was used for this messenger bag where I used a small magnet for a closer; I used a Simplicity pattern and altered the size. 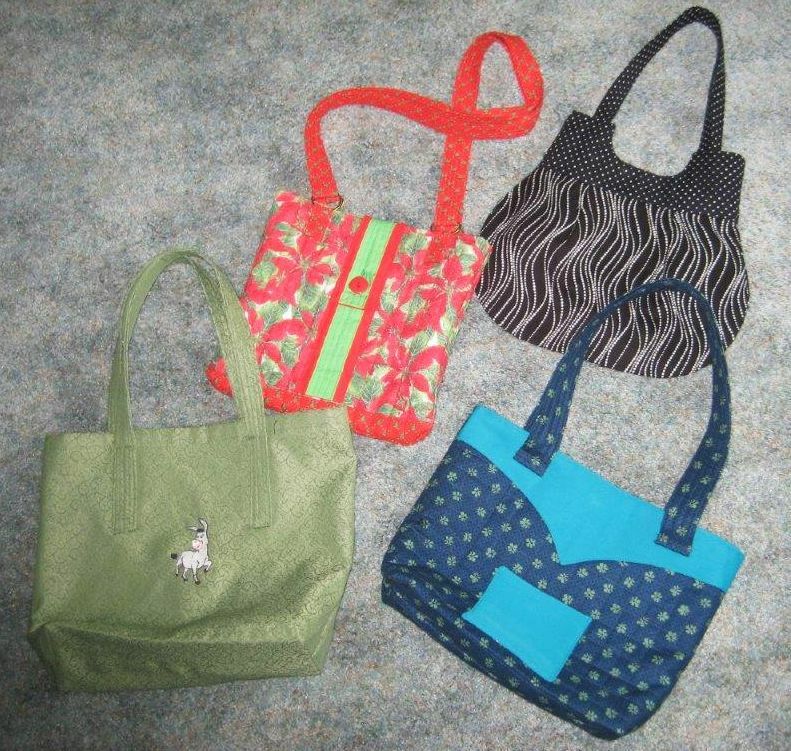 Four more purses; in 2017 I visited friends in Wesel, Germany where the town mascot is a donkey so I made the green shopping bag as a gift - with the embroidered donkey as humor. 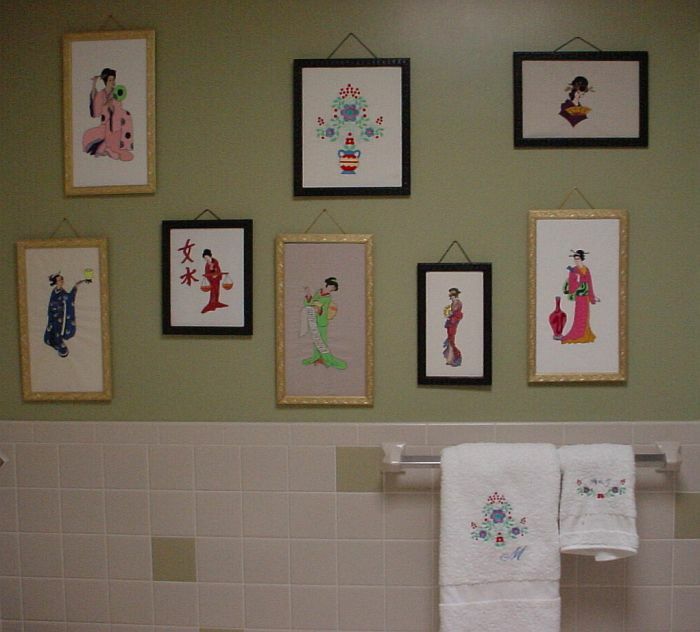 I like the colorful Geisha girl costumes so I embroidered and framed some for my main bath along with a matching towel set. The young Japanese salesman at Home Depot suggested using black and gold frames because they are traditional in Japan. 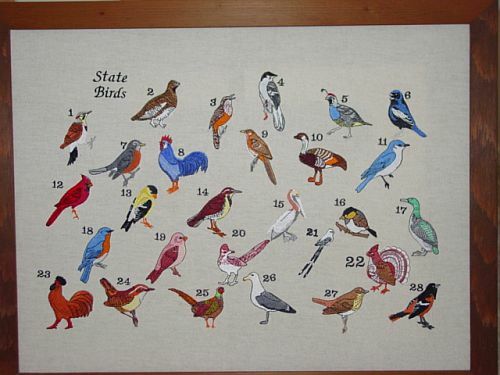 This is a list of state birds; there is a printed index on paper to go with this. It will be used as part of a lesson in my granddaughter's classroom. Here's a mural showing a few Connecticut birds. 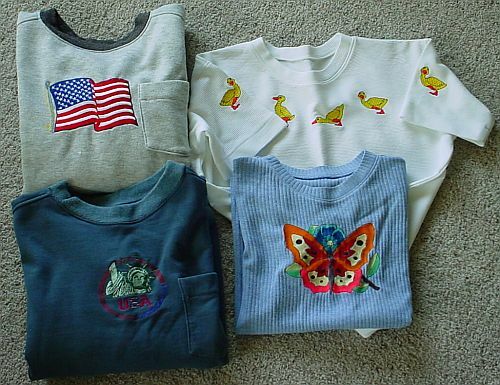 At the 2005 AEC in Boca Raton, instructor Jeannie Miller wore a jean jacket with Children of the World embroidered on the back and front. I tried to copy her idea with my own jacket but was unable to do an adequate job hooping. It was much easier to embroider on a flat piece of fabric. I used an 18"x 24" frame in place of the jacket for my version of Children of the World. 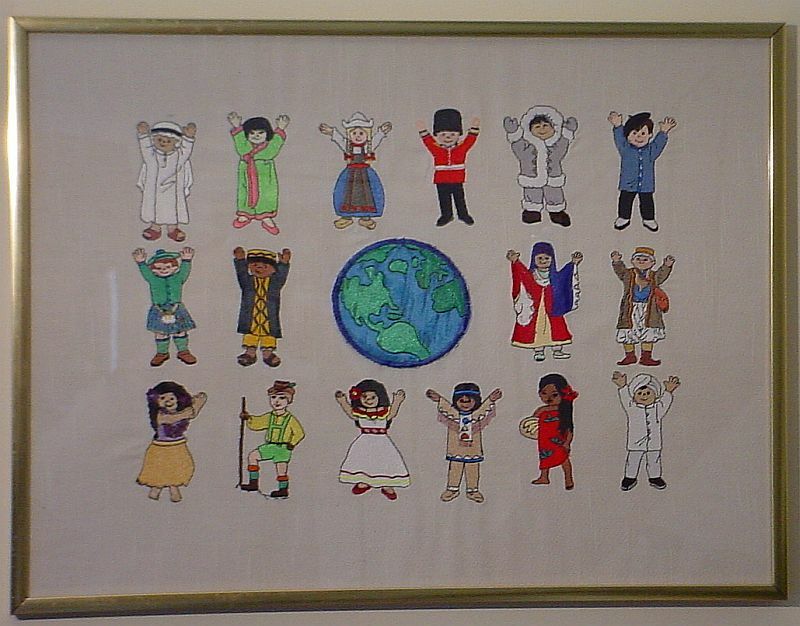 Most of the children designs and the globe came from Ann the Gran and were digitized by Sharon Tyler. My second grandson, Owen, needed wall decor for his room. 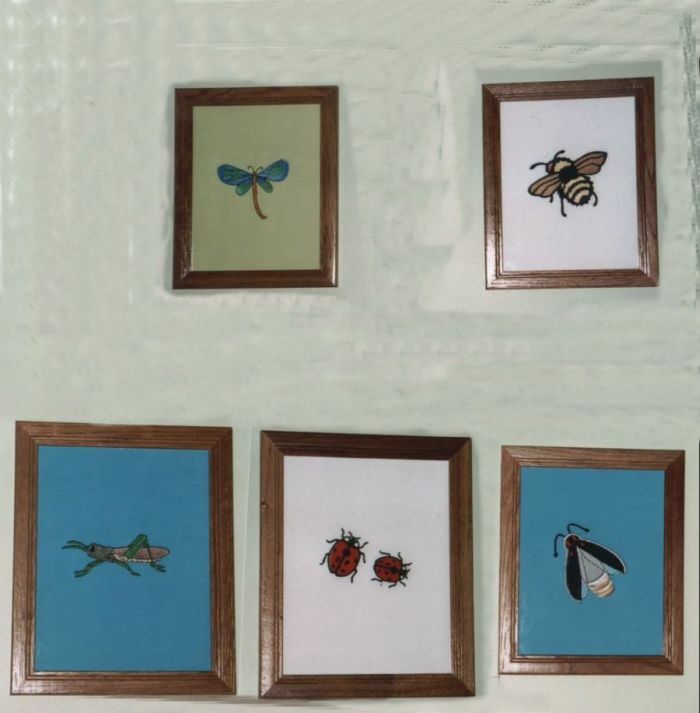 His mom was going to purchase bug pictures but I embroidered them instead. 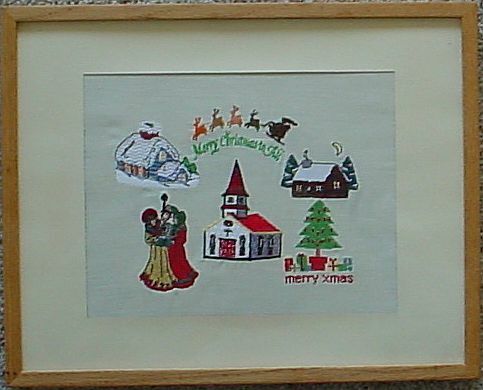 A Christmas Mural I made in October 2003. For the year 2004, I made a new Christmas mural (it's a tradition now). 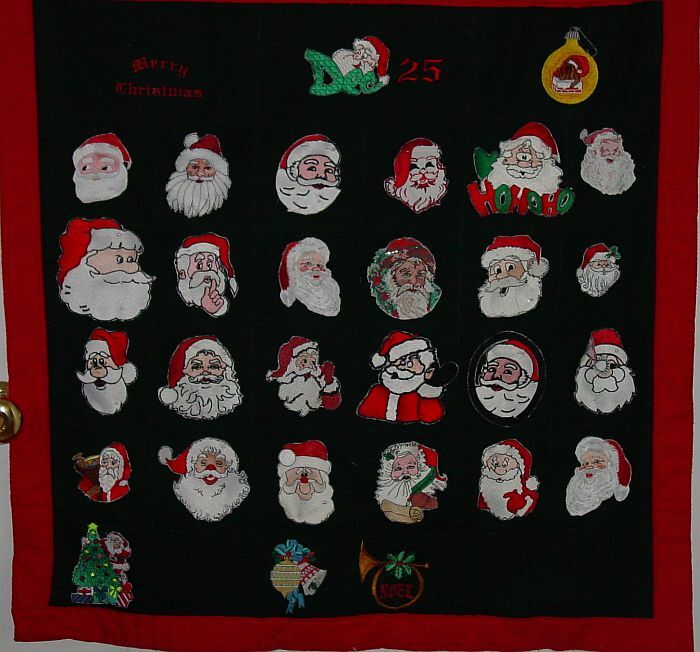 My advent calendar is a countdown to Christmas Day where each embroidered Santa Claus head represents a day. 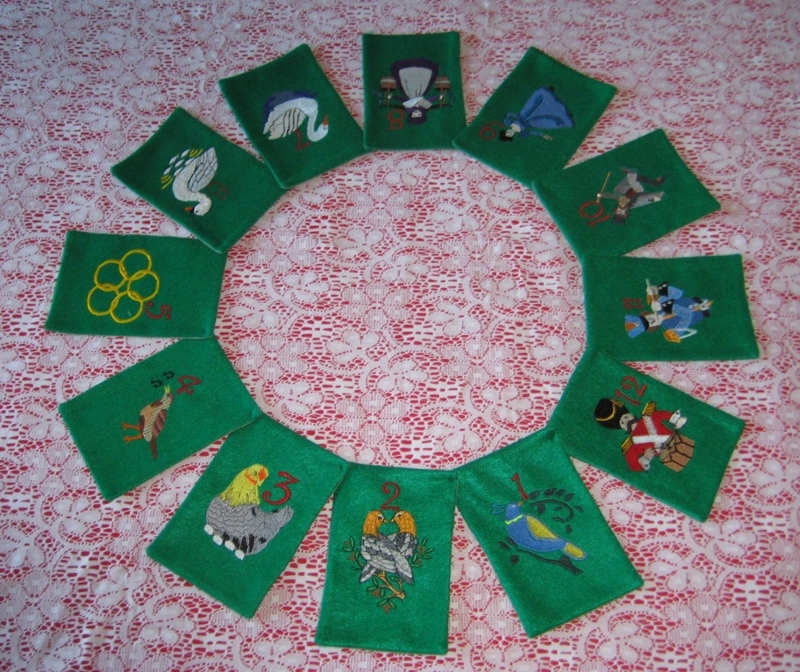 The individual heads are removed one per day and kept in a pocket (which doesn't show well in the picture). Snowmen are another winter tradition; I combined several comical designs for this 15" by 36" mural. I buy framed pictures at flea markets and use the frames for my murals. 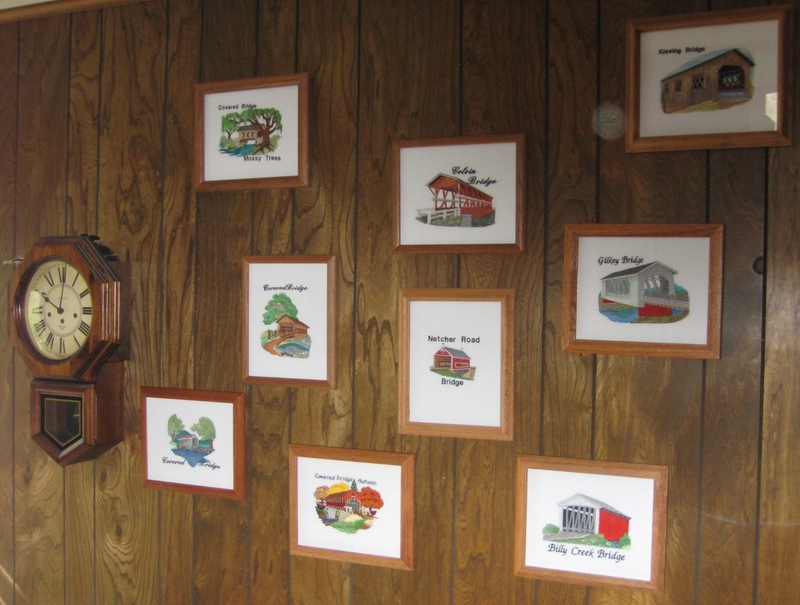 I embroidered and framed nine covered bridge designs from Embroidery Library. Some of these designs are very dense (the one at lower center took over 3 hours) but the 3D effect is very attractive. A new category: gluing embroidery to poster board. When stretching large embroidered fabric for framing, wrinkles were apparent around the designs so I cut out the designs and glued them directly to poster board. 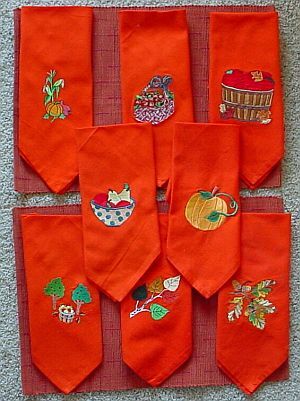 The embroidered cats were the first of these wall hanging projects followed by Santa Clauses. 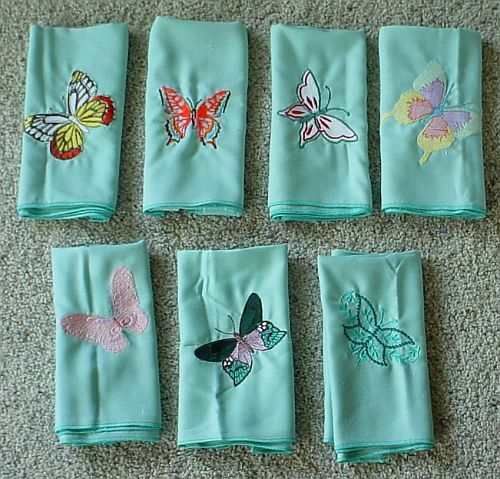 I often make "theme" items -- here are napkins with a different butterfly on each and napkins with fruits. 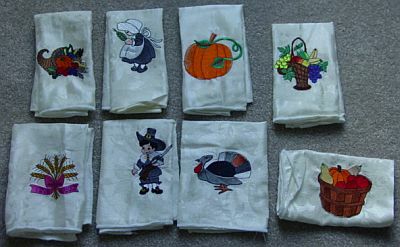 Some Thanksgiving napkins. 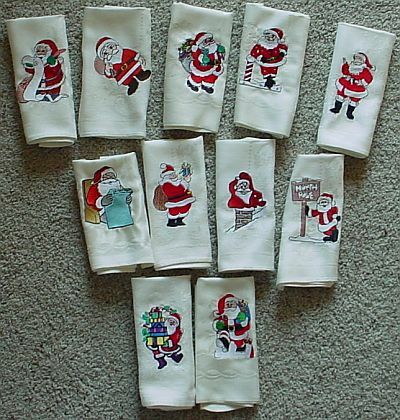 and some fall napkins and Santa napkins that will look nice until Christmas. In 2009 I made replaceable Christmas pillow covers. 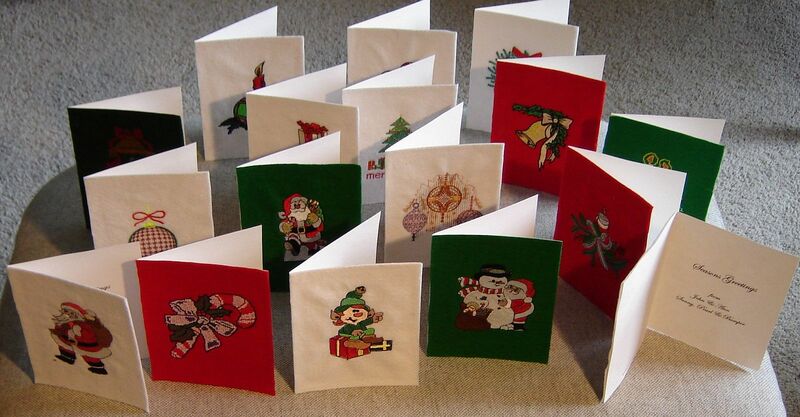 Embroidered Christmas cards, an idea from Dodie Hoover who sent me her creation last year. 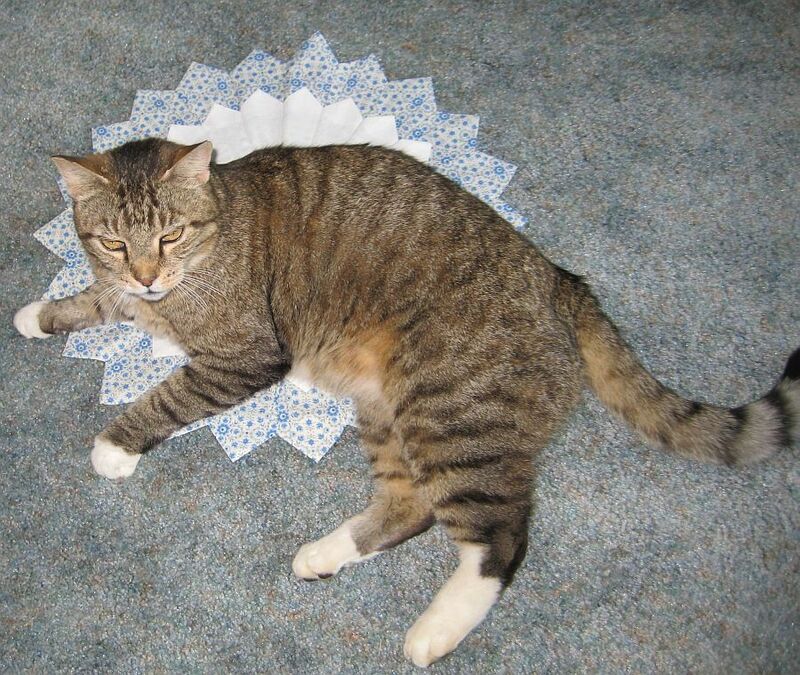 The Dresden quilt design is used here for a large trivet - it came out bigger than expected... It was made from wool scraps collected over the last 30 years. 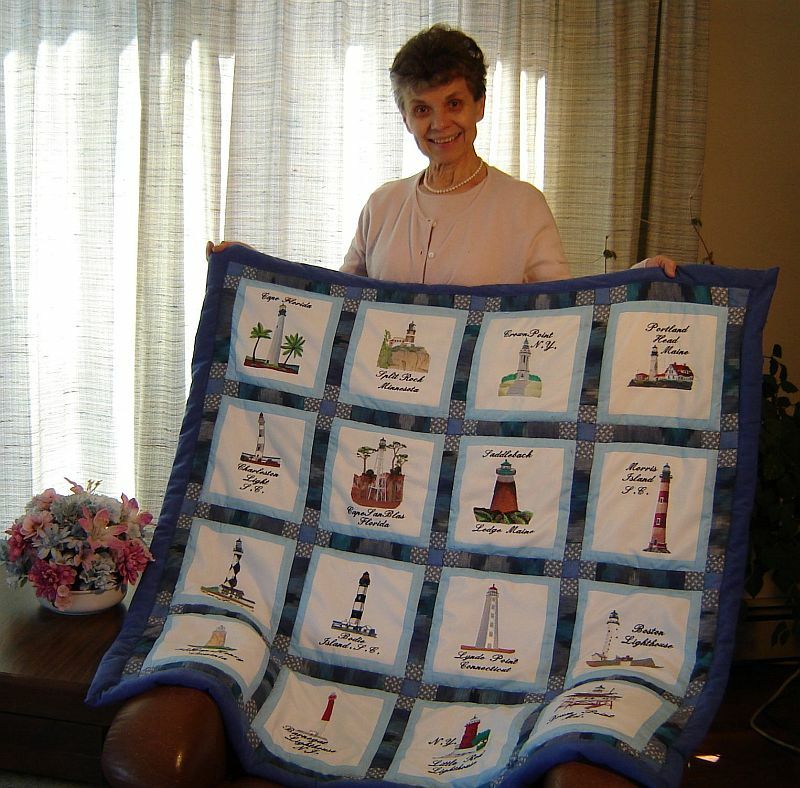 Credit again to Jenny from the Missouri Quilt Company for her tutorial. 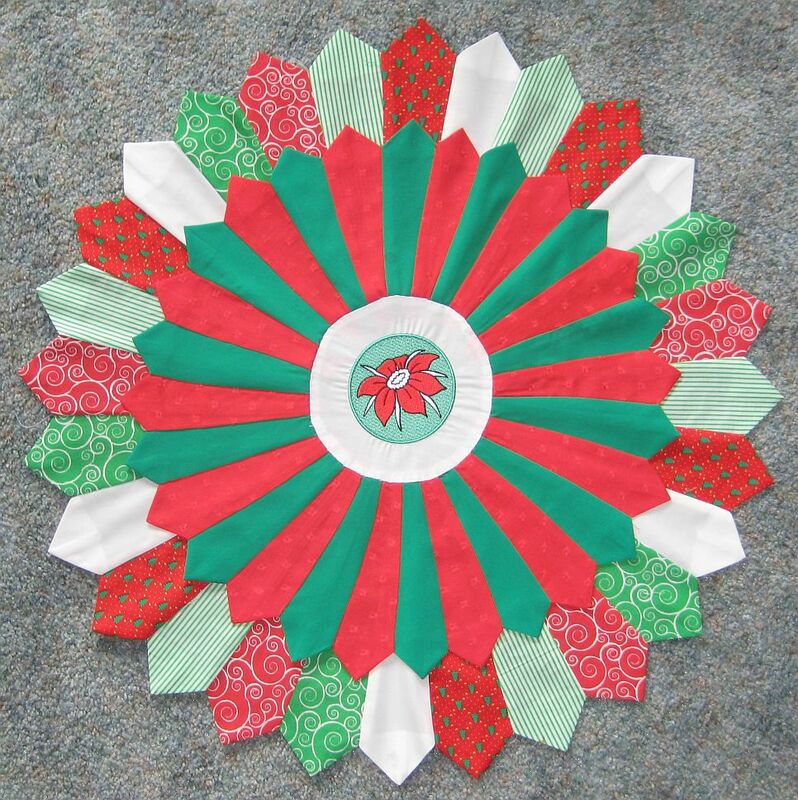 Another Jenny Doan design is this abstract Christmas tree table runner. 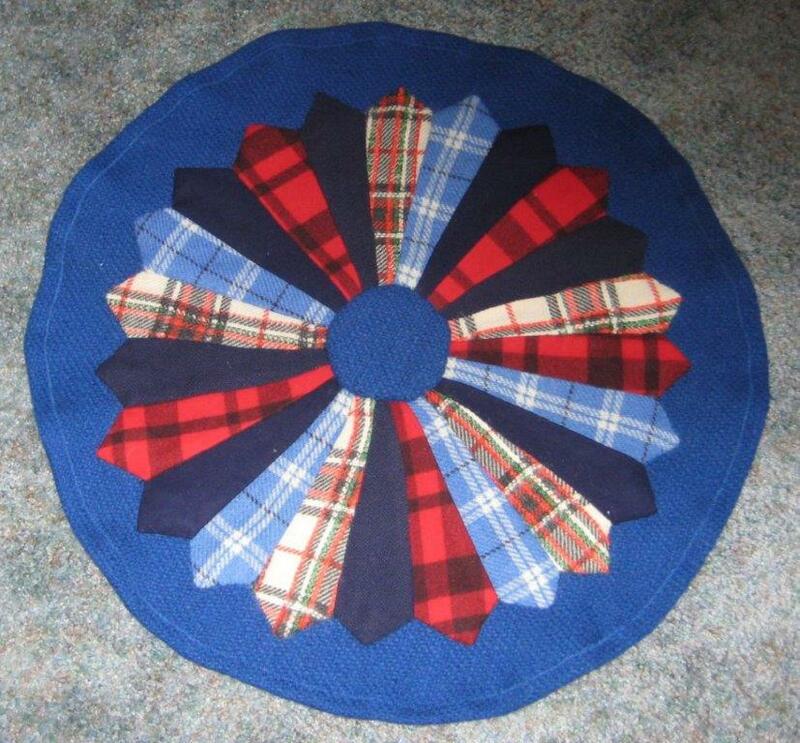 I like the Dresden plate design so I made a round Christmas table runner with a holly design embroudered in the center. 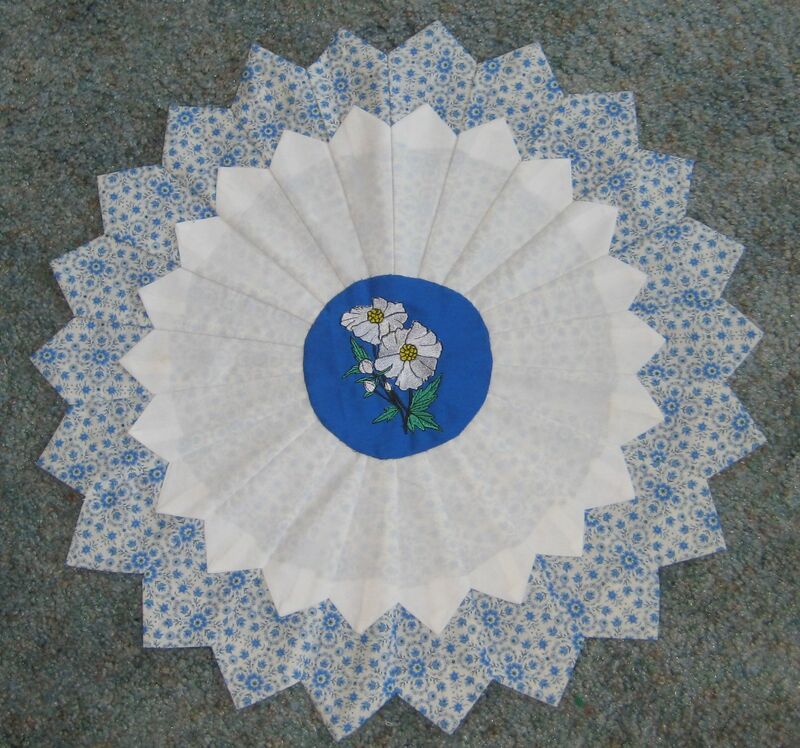 Another Dresden plate design, this time in blue and white with a matching blue flower embroidered in the center. 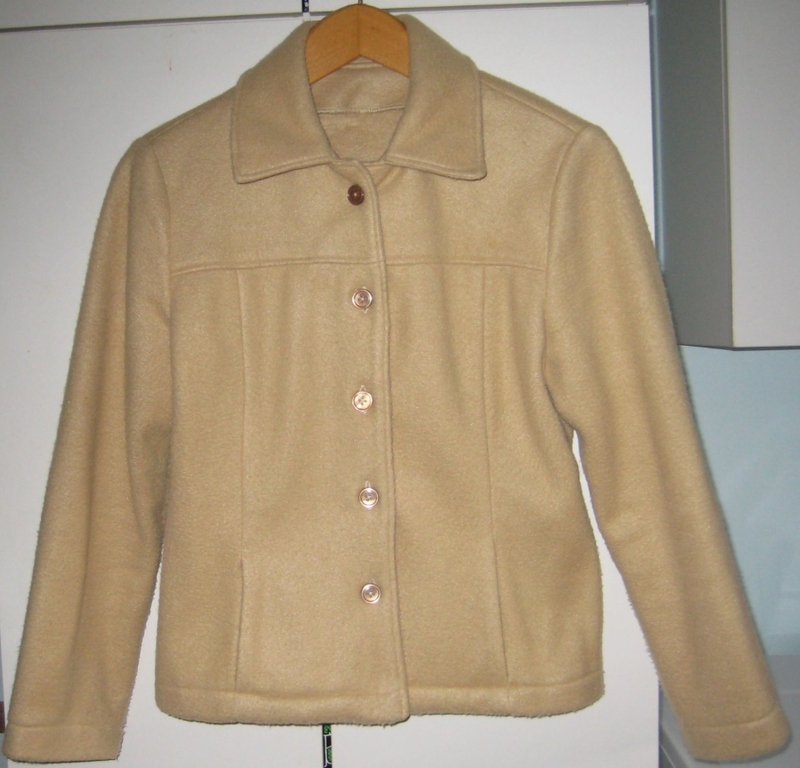 Both round Dresdens have an unattached top layer. As I was photographing the blue Dresden; our cat, Bumper, showed up to help. 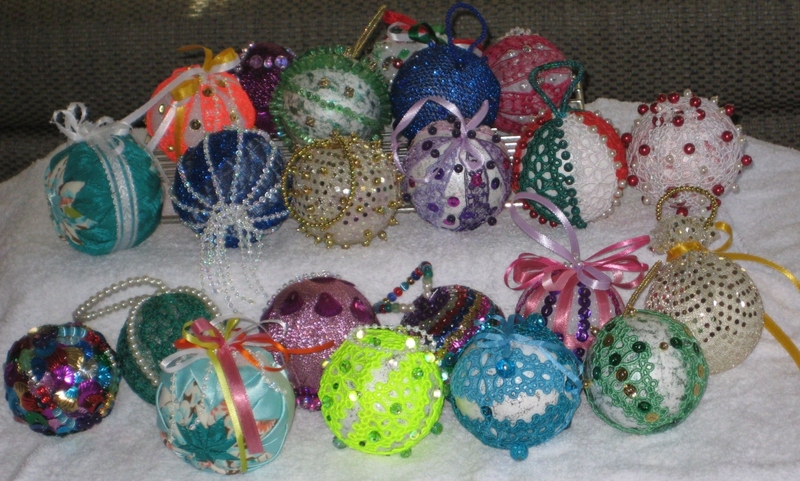 I combined embroidery, sewing and my newest hobby, beading to make Christmas bulbs from styrofoam balls. Here are 4 more. 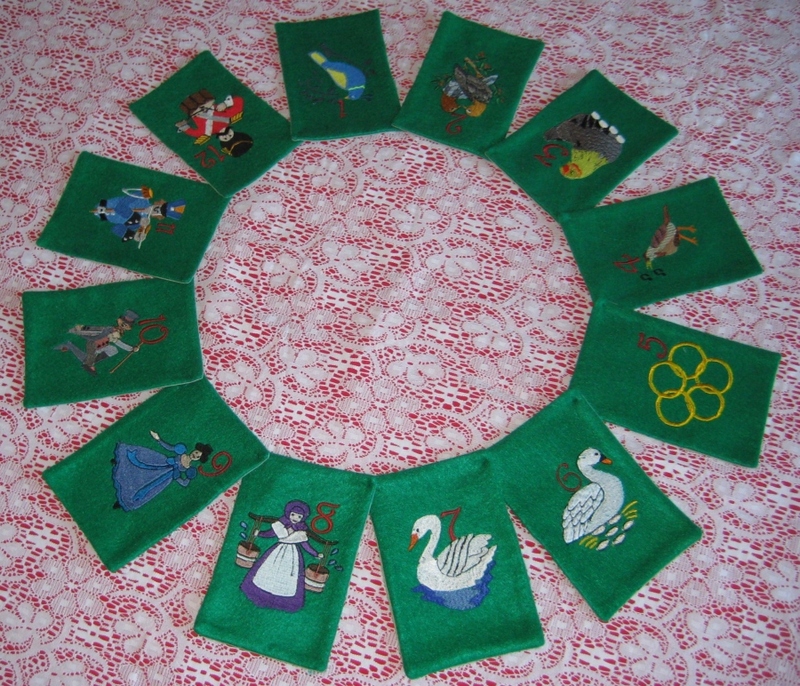 I used some quilting fabric scraps to make Christmas wreaths (click to enlarge). In addition to an embroidery machine one needs a little thread and a place to keep it near at hand. My ULT is on the desk just to the right of this peg board. Embird is my favorite embroidery program, I use it every day. PesView is a Freeware viewer for PES files. Check out Joachim's other free programs on this site too. The Thread Exchange Good prices and very pleasant to deal with, plus the easiest on-line ordering system I've ever used. The ULT group on Yahoo Friendly people, few ads, well moderated. 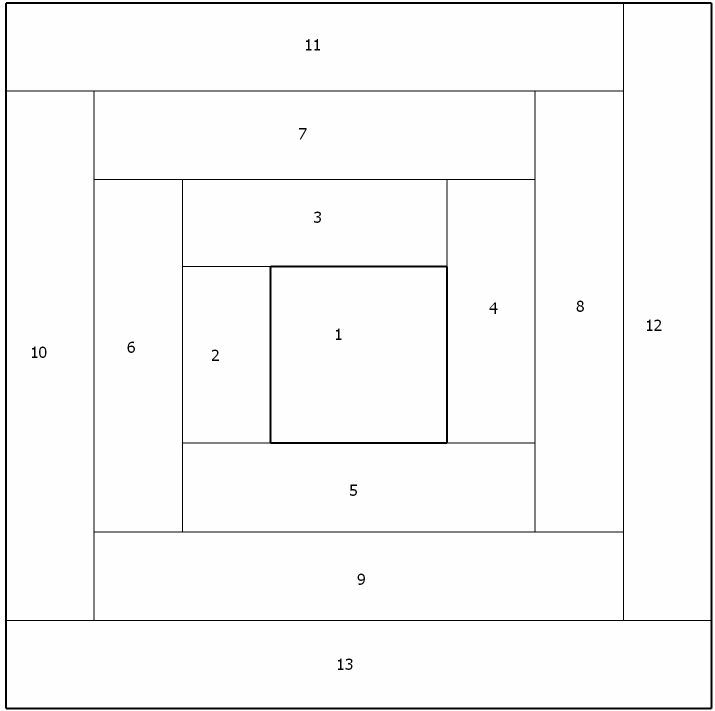 My Fixit page summarizes answers to common questions which have arisen on this group. Marvelous Creations has parts,accessories, and more for Brother machines. We went to a presentation by Chef Silvia, ate the food, bought the book, and have been preparing her recipes with vegetables from our garden - try the salmon recipe on her site, it is terrific!